(Nanowerk News) Researchers at the University of Tokyo have successfully produced graphene nanoribbons by making use of the phenomenon that inorganic nanomaterials self-assemble into regular structures on graphene. This will enlarge the possible applications of graphene, which is expected to be an important alternative material to silicon for semiconductor devices. Institute of Industrial Science Professor Shoji Takeuchi and Project Assistant Professor Won Chul Lee first found that gold(I) cyanide nanowires grow directly on pristine graphene in aqueous solution at room temperature, the molecules aligning themselves with the zigzag lattice directions of the graphene. The researchers then fabricated graphene nanoribbons with zigzag-edged directions by employing the synthesized nanowires as an etching mask. 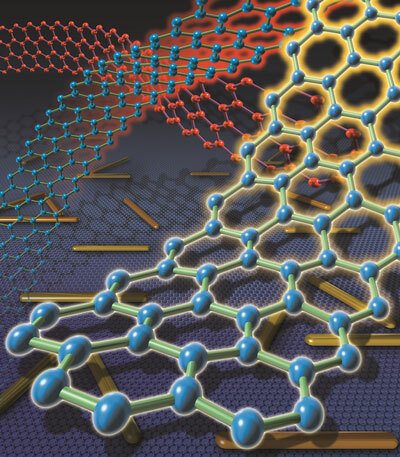 The graphene nanoribbons created were 10 nm in width and as thin as a single carbon atom. Both the nanowires and graphene nanoribbons formed along the zigzag lattice, offering a potential method for controlling the formation direction of graphene nanoribbons, something that had not been realized until now. This result of this novel top-down and bottom-up hybrid process is now available in Nature Nanotechnology ("Graphene-templated directional growth of an inorganic nanowire"). This research is a collaboration between the University of Tokyo, University of California at Berkeley, Ulsan National Institute of Science and Technology, Harvard University, Konkuk University and Lawrence Berkeley National Laboratory, as a part of ERATO “Takeuchi Biohybrid Innovation Project” by the Japan Science and Technology Agency.